On any given day in Maryland, around 665,420 people don’t know where their next meal might come from. 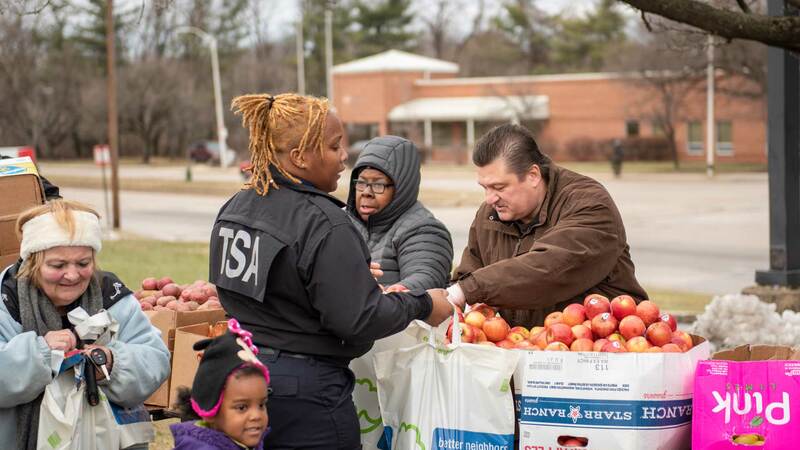 When the federal government shut down on December 28, it was clear that another 172,000 federal workers who call our state home would find themselves in a situation similar to their food-insecure neighbors, seeking out the food assistance safety net to make ends meet. Thankfully, thousands of Marylanders and a multitude of businesses stepped up to join us and show their support during a difficult time. Their donations have given us the flexibility to expand our Pantry on the Go Program and bring much-needed food directly into communities where affected workers live. Workers like Michael Westmoreland, a Coast Guard employee we met at a food distribution event for members of the American Federation of Government Employees in West Baltimore. 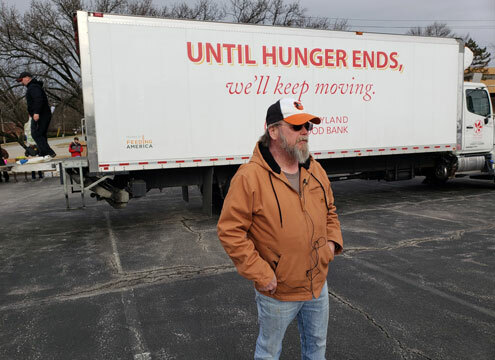 Westmoreland had been a long-time donor to the Maryland Food Bank − including facilitating some of the #FedsFeedFamilies campaigns – when the shutdown hit. “I never thought that I would have to go to the food bank. We would always donate, because a lot of families out there don’t have the luxuries we have. I’ve been through four furloughs − this the first time that I’ve needed to reach out for help.” Michael Westmoreland, furloughed Coast Guard worker. All told, MFB has scheduled Pantry on the Go events in communities statewide, including Glen Burnie, Ellicott City, Pasadena, La Plata, and Hagerstown. 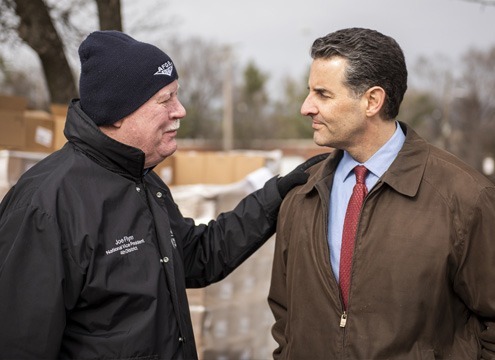 We’re also working with network partners in Baltimore, Ocean City, Salisbury, and other areas to supplement their orders so that they have more food to meet the increased demand they’re seeing in their communities. The shutdown has really opened a lot of eyes as to just how fine of a line it can be between food security and facing hunger, and how vital the food assistance safety net that we’ve built can be during unexpected times of need. In fact, a recent study found that about 40 percent of Americans are just one missed paycheck away from poverty, something that Jermaine Jones, the President of the Metropolitan Baltimore Council of AFL-CIO Unions, talked about at one of our recent events. Lisa, a single mother and federal worker who unexpectedly found herself in need, came to our Pantry on the Go event in Glen Burnie. Until federal workers like Michael and Lisa find it easier to make ends meet, we’ll be here for them, just as we are − every day – for the 665,420 Marylanders who regularly face hunger. Realizing the negative impact it was having on hard-working families and individuals, legislators in Washington, D.C. reached an agreement on January 25, 2019 to fund the federal agencies affected by the shutdown. The deal allowed the furloughed federal workers and contractors to return to their jobs. 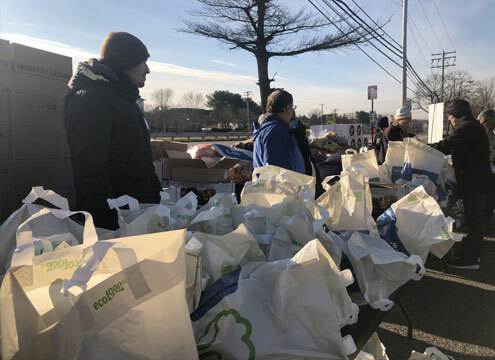 During the shutdown’s 35 trying days, we were able to help more than 2,500 families by providing enough food to account for nearly 60,000 meals at dedicated Pantry on the Go and other food distribution events stretching from Cumberland to Salisbury. Additionally, we supplied our network partners — the community food pantries, homeless shelters, soup kitchens, etc. we work with throughout the state — with enough extra food to provide another 66,000 meals. While some partners knew that there were furloughed workers in their communities, others found themselves in an unexpected position. Thanks to our generous supporters, the Maryland Food Bank was prepared to help these individuals and families who unexpectedly needed food, while also ensuring we could continue to be the everyday safety net for Marylanders who face hunger on a regular basis. I used to have Snap Benefits. Now I’ve just about went through my change jar which wasn’t much to begin with but it was keeping me in milk and bread for awhile. But I really miss not having the little extra I was getting. Please call us at 1-888-808-7327, or email snapteam@mdfoodbank.org – one of our SNAP coordinators would be happy to help you.